As the First Congress prepared to commence operations, emancipation advocates were seeking regulation of the slave trade or abolition of slavery while defenders of the “peculiar institution” contemplated secession if that happened. The latter’s House representation, of course, was bolstered by having their population increased by 60% (3/5th) of the number of their slaves. Southern reaction to these petitions was “explosive.” They accused the Quakers of “intemperate and unwarrantable meddling,” of “an intolerant spirit of persecution” against the slave states, of disloyalty and cowardice during the Revolutionary War (because on religious principles they did not bear arms) and the promotion of “Insurrections & bloodshed & persecution.” A Georgia Congressman said religion “from Genesis to Revelations” had approved of slavery. The three petitions were referred to a House select committee, which later reported that Congress had no power to emancipate slaves or interfere with the slave trade before 1808. On the other hand, the committee said, Congress had the power to put a tax on imported slaves and thereby motivate slave-owners and slave states to improve their treatment of slaves. Thereafter the pro-slavery forces went on the attack. Their leader quoted Scripture, suggested that nothing could be done about it, that the new country needed exports to Africa and that slaves were incapable of mastering freedom. Some of the nation’s leaders personally opposed slavery—George Washington, Alexander Hamilton and James Madison-even though they were slave owners, but remained quiet in Congress because they feared loss of Southern support for other measures or a breakup of the new country. The result? The House concluded that all power to end slavery and tax imported slaves rested with the states. In short, it was an endorsement of the status quo and the protection of slavery. U.S. First Congress: Establishment of Racial Categories for the U.S. Census and U.S. Citizenship Naturalization, 1790, dwkcommentaries.com (Feb. 20, 2017). 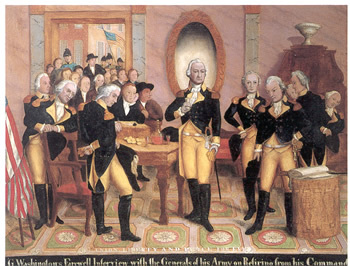 The American Revolutionary War formally ended with the signing of the Treaty of Paris on September 3, 1783. 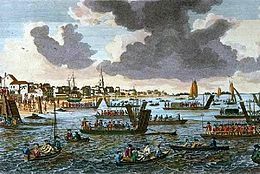 At that time the British were nearing the end of their seven-year occupation of New York City after their victory over the colonists in York Island (Manhattan) in September 1776. 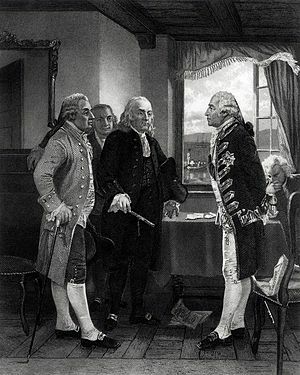 Several weeks before the signing of the Treaty, Sir John Carleton, who was in charge of the British forces in the City, advised the President of the Continental Congress that the British were proceeding as fast as possible with the withdrawal of military personnel, Loyalists and liberated slaves, but that he could not then provide an estimated date for the completion of that process. Thereafter the British evacuated more than 29,000 military personnel, Loyalists and liberated slaves although the Treaty of Paris required them to return the slaves to their owners. The process was completed on November 25th. After the evacuation was complete that day, General Washington, New York Governor George Clinton and men in the Continental Army marched down Broadway to the Battery to formally take possession of the City. 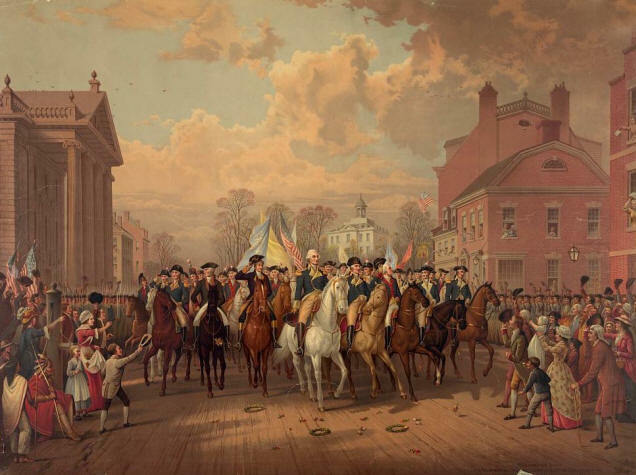 Approximately a week later (on December 4th), General Washington invited the officers of the Continental Army to join him for a farewell dinner at noon at the City’s Fraunces Tavern at 54 Pearl Street. After each of the officers had taken a glass of wine, General Washington said, “I cannot come to each of you but shall feel obliged if each of you will come and take me by the hand.”‘ As the officers did so, Washington was in tears. 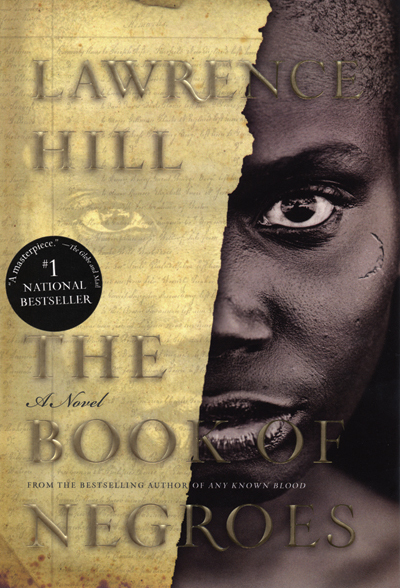 The British evacuation of the City plays a prominent role in a fascinating novel, The Book of Negroes, by Canadian novelist Lawrence Hill. The novel follows Aminata Diallo, a girl who is abducted at age 11 from her West African village in the mid- 18th century and sold into slavery in the U.S. She is intelligent and learns how to read and write. She is in New York City at the end of the American Revolutionary War, and because she is literate is hired by the British to facilitate their evacuation of the city. Her task is to create the Book of Negroes, an actual historical document that lists 3,000 freed Loyalist slaves who requested permission to leave the U.S. in order to resettle in Nova Scotia. There are many other intriguing facets of her life that are covered in this amazing novel. Various aspects of the American Revolutionary War have been discussed in prior posts. 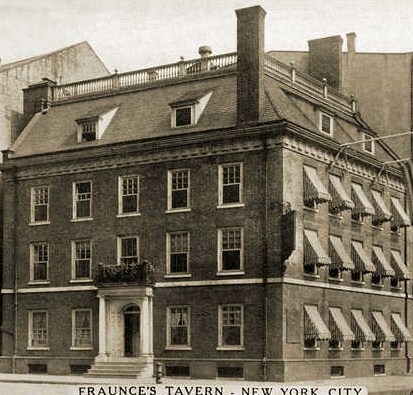 The Fraunces Tavern had opened for business in 1762 in a former mansion that was built in 1719. It is still in business today along with its Fraunces Museum. When I was an associate attorney with a nearby Wall Street law firm, 1966-1970, colleagues and I had dinner there several times. In the U.S., Australia and New Zealand, the novel was published under the title Someone Knows My Name. The actual Book of Negroes is now online. Immediately after General George Washington’s victory at Harlem Heights on September 16, 1776, he and the Continental Army remained at the northern end of York Island (Manhattan). 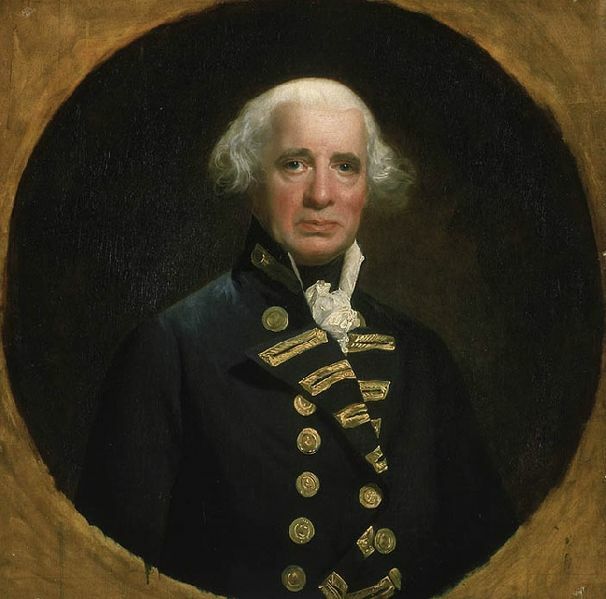 Twenty-six days later (October 12th) General William Howe made his next move. He had 90 British flat-boats with 4,000 troops row up the East River to Throggs Neck, a narrow peninsula that demarcates the passage between that River and Long Island Sound. There the troops disembarked with the objective of establishing a line across the island to the Hudson River and thereby encircling the Continental Army and preventing their escaping from York Island. The British inland advance, however, was blocked by swamps and some Continental troops. 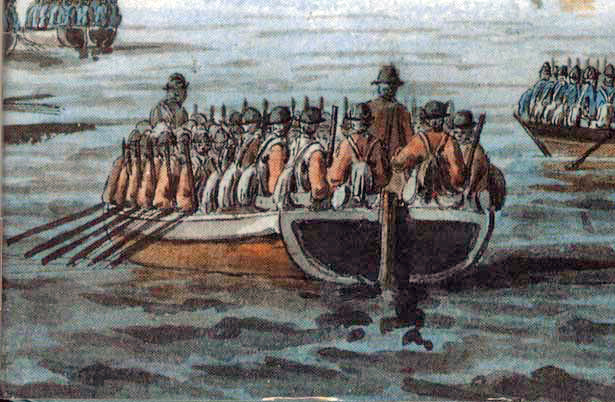 Howe responded by having his troops return to the boats and go three miles north to Pell’s Point (or Pelham). There on October 18th, the British troops again disembarked with the same objective. Inland were 750 Continental Army men under the command of Col. John Glover, who positioned his troops behind a series of stone walls and attacked the British advance units. As the British overran each position, the American troops fell back and reorganized behind the next wall. 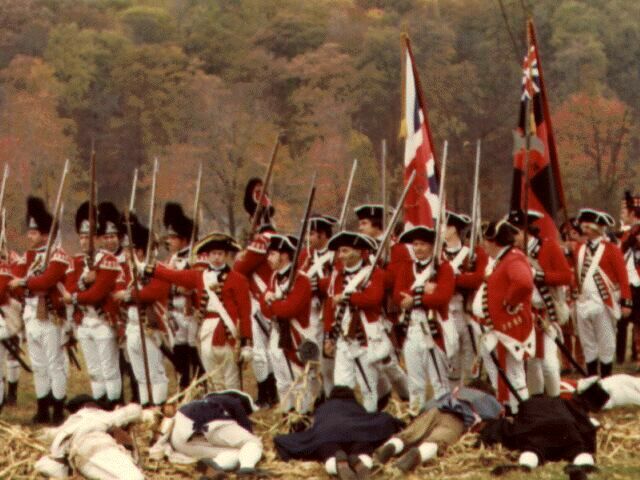 After several such attacks, the British broke off, and the Americans retreated. This battle or skirmish delayed British movements long enough for Washington to move the main Continental army 18 miles north to White Plains, thereby avoiding being surrounded on Manhattan. In White Plains by October 22nd Washington established a defensive line near the village anchored by Purdy Hill on one end and Hatfield Hill at the other end. Across the line and the Bronx River was Chatterton’s Hill, which was left undefended. 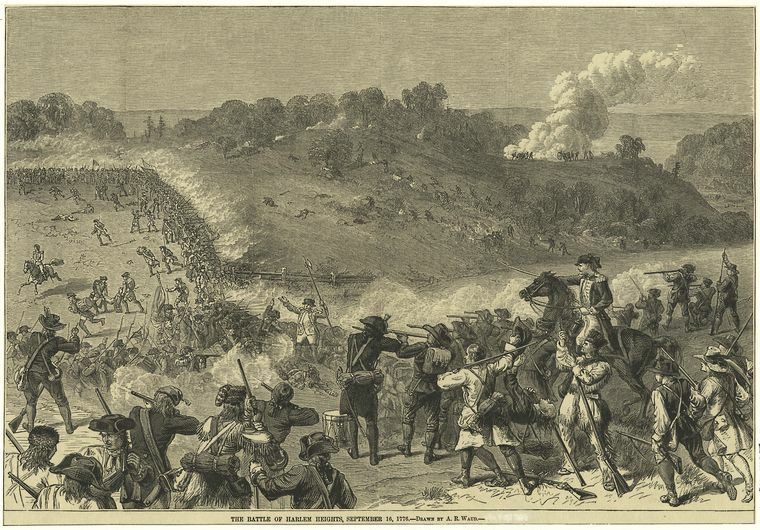 When General Howe and the British troops arrived in White Plains on October 28th, Howe immediately recognized the importance of Chatterton’s Hill and made it the focus of their attack. Washington’s attempt to mount a defense of that Hill failed, and the British won the battle with 300 Americans killed, wounded and captured. One of those killed on the battlefield was my maternal fifth great-grandfather, Perley Brown. The two sides remained in their positions for the next two days. On October 31st General Howe planned to attack the Americans, but heavy rain prevented this move. That night, under the protection of t he rain, Washington withdrew his troops to the north. The next day, November 1st, Howe again found that Washington had eluded his grasp. Washington continued his retreat to the north and then west over the Hudson River into New Jersey for their further retreat to Pennsylvania in late December. The British returned to Manhattan. In addition to the hyperlinked sources in this post, it also draws from Arthur Merrill, The Battle of White Plains (Analysis Press; Chappaqua, NY, 1975); David McCullough, 1776 at 229-34(New York; Simon & Schuster 2005); T. Harry Williams, Richard N. Current & Frank Freidel, A History of the United States [To 1876], at 151 (New York: Alfred A. Knopf 1959); Henry Steele Commager & Richard B. Morris, The Spirit of ‘Seventy-Six: The Story of the American Revolution as Told by Participants, Ch. Eleven (New York: Harper & Row, 1967). From 1969 through early 1970, I was a lawyer for a Wall Street law firm working for IBM on the IBM antitrust cases and spent a lot of time at a special office for the cases in White Plains. Unfortunately I did not scout out the sites of this battle. Carol Willits Brown, William Brown–English Immigrant of Hatfield and Leicester, Massachusetts, and His Descendants c. 1669-1994 at 17 (Gateway Press; Baltimore, MD 1994). On the morning of August 30, 1776, it was apparent that the British had totally routed the colonists in the Battle of Brooklyn (Long Island). 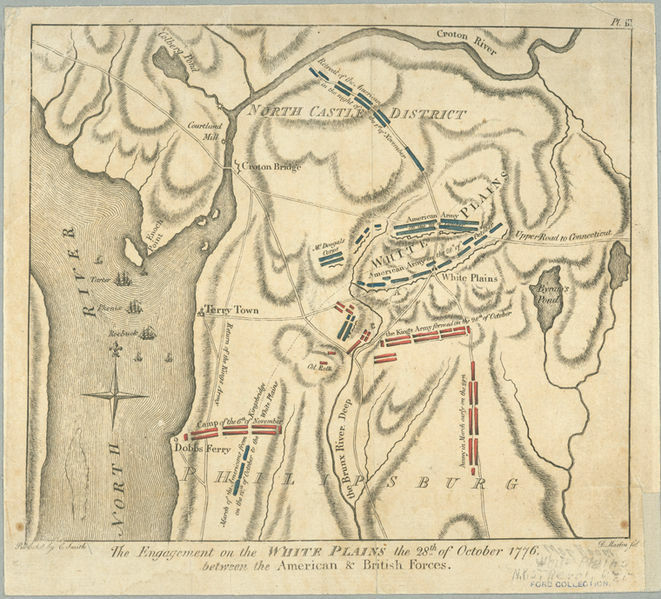 But the British commander, General Howe, did not press their advantage and immediately attack the American forces on the southern end of York Island (now Manhattan). General Washington at his New York City headquarters obviously knew that the British would be attacking the City and the Island, but did not know where or when. 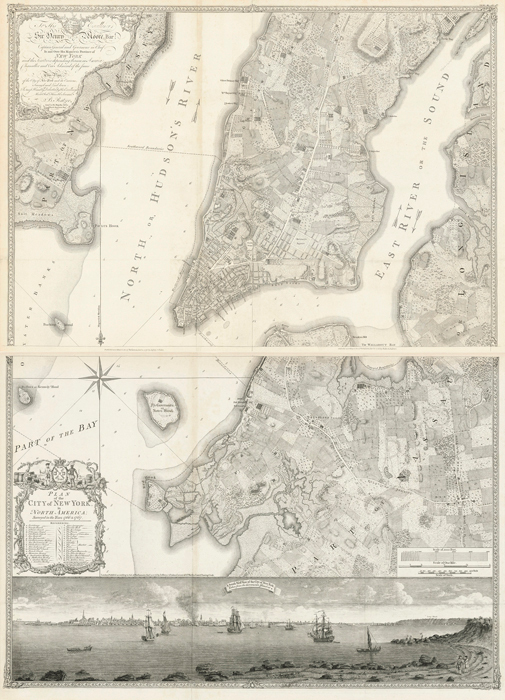 On September 12th (the day after the unsuccessful Staten Island Peace Conference), Washington decided to abandon New York City and ordered the main part of the Continental Army to move north on the island as soon as possible to King’s Bridge connecting the island with what is now the Bronx. By September 14th most of this American force had reached the Harlem Heights on the west side of the island and King’s Bridge at the northern end of the island. The balance of the forces remained at the southern end of the island. On the morning of the 15th five British frigates sailed up the East River and near Kips Bay (on the east side of Manhattan and just south of the present-day U.N. Headquarters) started a cannon bombardment of the island. Thereafter 13,000 British troops left the ships and invaded the island from the east in flat-boats. 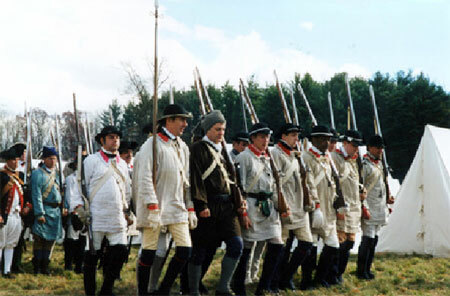 Some of the British soldiers immediately marched south to occupy New York City. 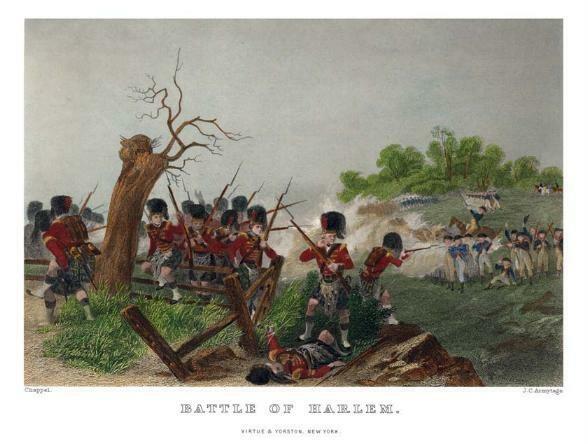 On September 16th 5,000 British troops reached the 1,800 American soldiers on Harlem Heights. The British attacked, and their bunglers sounded a fox-hunting call know as “gone away,” meaning that the fox is in full flight from the hounds. The Continentals, who had been in orderly retreat, were infuriated by this insult. They halted and counter-attacked. The British retreated and withdrew. The British suffered 14 to 90 killed and 78 to 300 wounded. The Americans had 30 killed and 100 wounded. Troop movements for Battle of Harlem HeightsThe map of Long Island and Manhattan Island shows the troop movements leading up to this Battle. 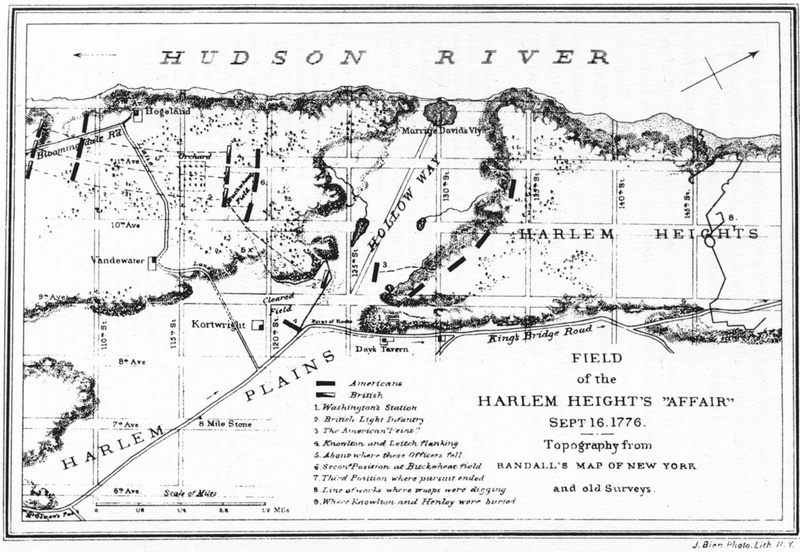 The map to the right of Long Island and Manhattan Island shows the movement of troops leading up to the Battle of Harlem Heights. This victory, minor though it was, was the first victory of the War for General Washington and bolstered American morale. Carol Willits Brown, William Brown–English Immigrant of Hatfield and Leicester, Massachusetts, and His Descendants c. 1669-1994 at 17-25 (Gateway Press; Baltimore, MD 1994). In addition to the hyperlinked sources in this post, it also draws from David McCullough, 1776 at 208-219 (New York; Simon & Schuster 2005); T. Harry Williams, Richard N. Current & Frank Freidel, A History of the United States [To 1876], at 151 (New York: Alfred A. Knopf 1959); Henry Steele Commager & Richard B. Morris, The Spirit of ‘Seventy-Six: The Story of the American Revolution as Told by Participants, Ch. Eleven (New York: Harper & Row, 1967). 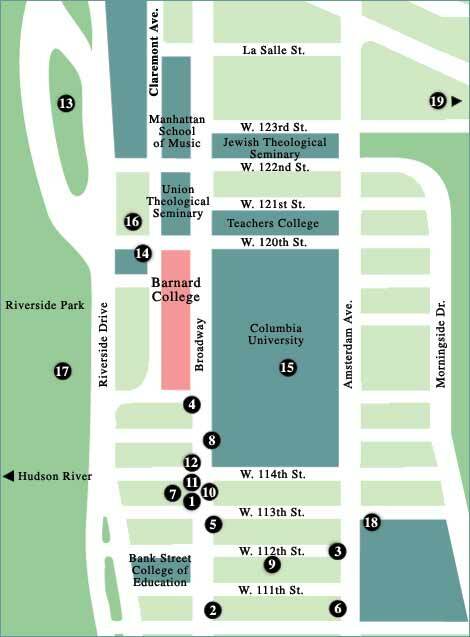 This area is now known as Morningside Heights, 110th to 125th Streets from Riverside Drive on the west to Morningside Drive on the east. It is the home today of such institutions as Columbia University, Barnard College, Grant’s Tomb, the Cathedral of St. John the Divine, Union Theological Seminary and St. Luke’s Hospital. During the summer of 1776, a British military force of 32,000 troops and 10,000 sailors on more than 400 ships assembled in Staten Island and the New York Harbor. They were obviously preparing for an attack on New York City at the southern end of York Island (now Manhattan). General George Washington at his headquarters in the City obviously knew of the assembling adversary forces and of the approaching battle. But he did not know when or where the attack would come. Therefore, Washington split the Continental Army of 19,000 troops into fortified positions in the City and in Long Island across the East River from the City. In further preparations for the forthcoming battles, the colonial forces that Spring and Summer constructed Fort Stirling on present-day Brooklyn Heights (Long Island) overlooking New York City and four other nearby forts. Washington was aware of the initial British movement into Long Island, but was told it only involved 8,000 to 9,000 troops. Therefore, he thought this was a diversionary move and that the main attack would be on York Island (Manhattan). As a result, Washington only sent an additional 1,500 troops to Long Island to bring the total colonial force to 6,000 at that location. Five days later, August 27th, the British launched their attack. Its apparent major focus was the center of the American fortifications on the Guanus hills southeast of Brooklyn Heights. Despite the heavy colonial fortifications, the British met with little resistance at this site. In fact, however, the main British contingent advanced on the unguarded Jamaica Pass, which was the eastern-most passage through the Guana Heights. Washington and his exhausted men fell back that day to their fortifications on Brooklyn Heights, waiting as night fell for a final British assault. Most of the American soldiers were in a trap, facing 20,000 British regulars at their front, and a mile-wide river at their backs. All the British navy had to do was to move a few warships up the East River to prevent Washington’s escape, and the war would be over, the revolution defeated. But British General Howe did not press the British victory with an immediate pursuit of the retreating colonial forces. Instead, he halted the attack and started preparations for a siege of the American fortifications in Brooklyn Heights and Cobble Hill. On August 29th, the temperature dropped sharply and the rain came in torrents on the unsheltered American army. This storm prevented five British warships from advancing up the East River to encircle the Americans in Brooklyn Heights. That same day Washington ordered his troops to withdraw in the dead of night across the river to Manhattan. The storm threatened this evacuation, but at about 11:00 p.m. the wind shifted and facilitated the evacuation. John Glover’s Massachusetts sailors and fishermen with every kind of small craft started over the river from New York City to rescue Washington’s army. Early the next morning of the 30th, many of Washington’s men were still on Long Island. But a fog appeared on the Long Island side of the East River that concealed the final movement of the American troops to Manhattan. The entire maneuver was completed by 7:00 a.m. that morning, having taken 13 hours to ferry 9,000 men, their horses and their equipment across the East River. Later that morning the British were surprised to discover the colonial forces had escaped. 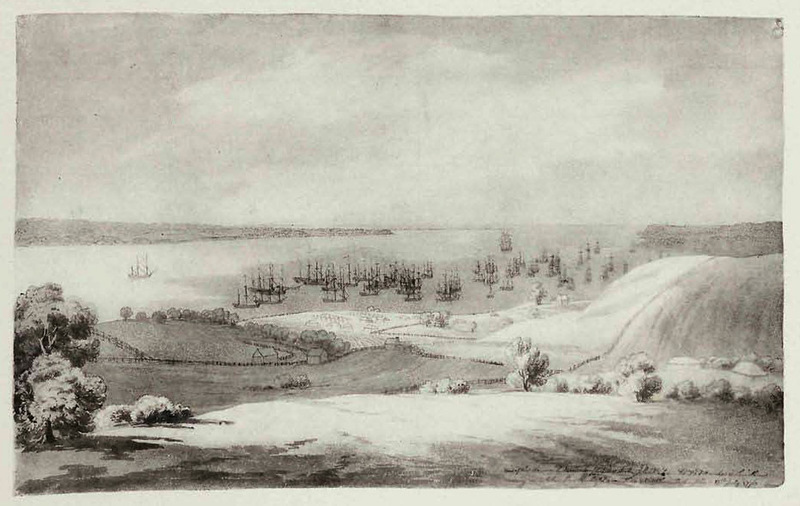 After that discovery, the British occupied the American fortifications on Brooklyn Heights. When the last shot was fired, 1,200 Americans were dead and another 1,500 wounded, captured or missing. The British suffered a mere 60 dead and 300 wounded or missing. This was the first major battle of the War and what turned out to be the largest battle of the entire War, and it was a disastrous one for the Americans. My maternal fifth great-grandfather, Perley Brown, from Leicester (Worcester County), Massachusetts was stationed in New York City at this time and thus did not fight in this battle. In addition to the hyperlinked sources in this post, it also draws from David McCullough, 1776 at 122-197 (New York; Simon & Schuster 2005); T. Harry Williams, Richard N. Current & Frank Freidel, A History of the United States [To 1876], at 151 (New York: Alfred A. Knopf 1959); Henry Steele Commager & Richard B. Morris, The Spirit of ‘Seventy-Six: The Story of the American Revolution as Told by Participants, Ch. Eleven (New York: Harper & Row, 1967). From July 1966 through March 1970, my family and I lived in Brooklyn Heights where some of the Battle of Brooklyn (Long Island) occurred. As a result, I frequently walked around this area, but unfortunately I did not scout out these historical sites. Carol Willits Brown, William Brown–English Immigrant of Hatfield and Leicester, Massachusetts, and His Descendants c. 1669-1994 at 17-23(Gateway Press; Baltimore, MD 1994). On March 17, 1776, the 11-month colonists’ Siege of Boston ended when the British troops and their dependants evacuated the town of Boston. A fleet of 120 British ships set sail for a British military base in Halifax, Nova Scotia with nearly 10,000 British troops and over 1,000 dependants. This was discussed in a prior post. 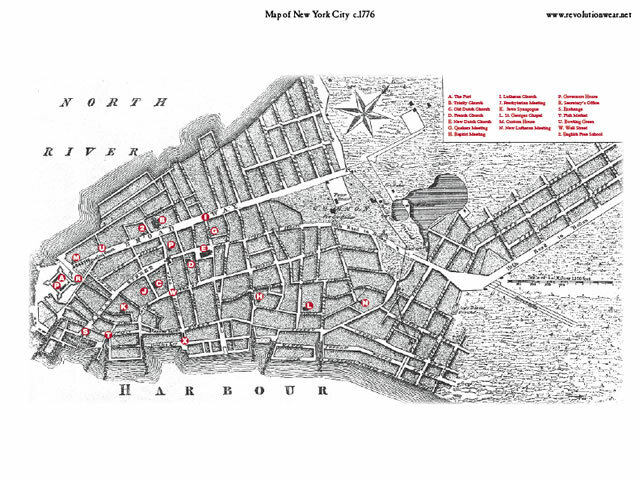 Both sides’ attention next turned to New York City, which then was a town of 25,000 at the southern tip of the island of Manhattan (then known as York Island). This post will review what is known as the Campaign for New York and New Jersey, March 18, 1776, through January 1777. For the British, the City was an obvious strategic target. It had a large harbor from which the vastly superior British navy could easily command the area and be a base to conquer the middle colonies to the south and west. The terminus of the Hudson (or North) River into that harbor would provide the British with a route north to connect with British forces in what is now Canada and thereby potentially separate New England from the other colonies. Moreover, many British Loyalists lived in the City and thus made it a friendlier host for British troops than Boston had been. The strategic importance of the City also was obvious to General George Washington. 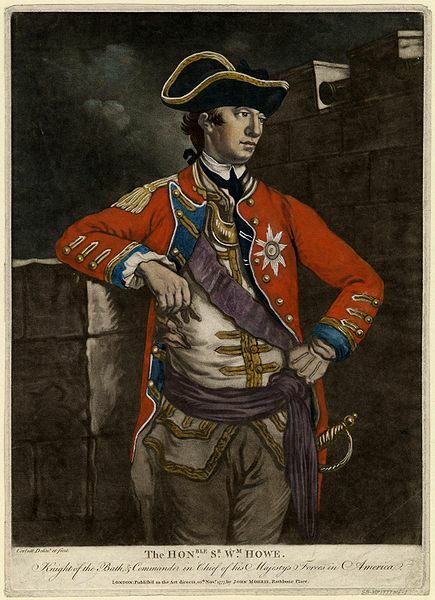 Not knowing that the British troops were going from Boston to Nova Scotia, he was worried that they would instead be sent directly to New York. Therefore, Washington immediately after the British evacuation of Boston sent some colonial regiments from Boston to New York to join the colonial forces already there under the command of General Charles Lee. 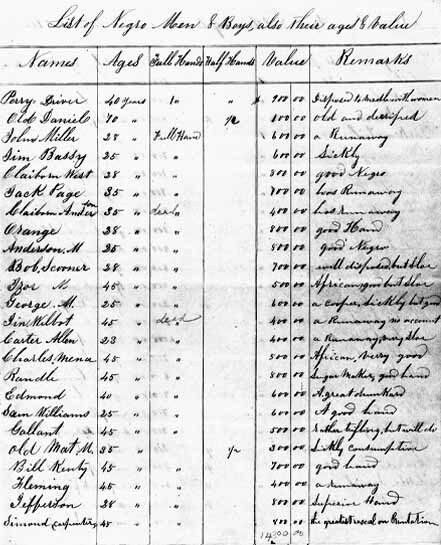 Thereafter other colonial troops were sent from Boston, including my 5th maternal great-grandfather, Perley Brown, and his brothers William and Benjamin. Perley and his comrades arrived in New York City in late July on a ship from New Haven, Connecticut. These transfers of troops from Boston were not easy. The men first had to march 100 to 120 miles over five to seven days to the Connecticut ports of New Haven or New London, where they boarded sailing ships to take them via Long Island Sound to New York City. 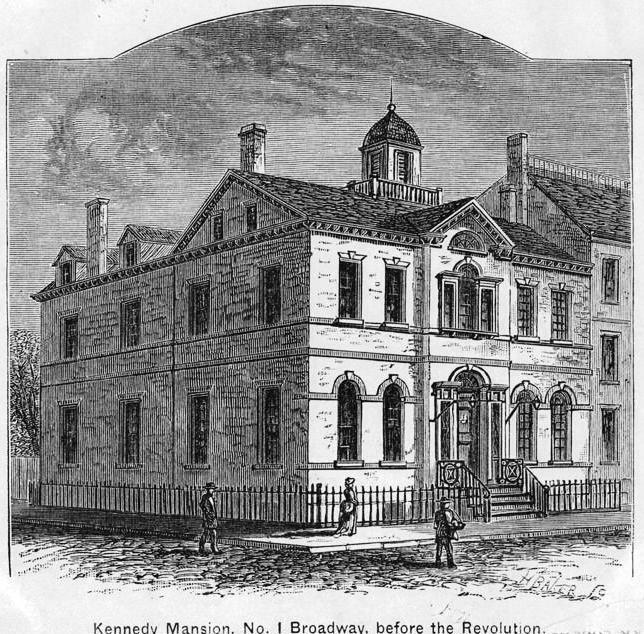 General Washington himself arrived in the City on April 13th and established his headquarters in the Archibald Kennedy Mansion at No. 1 Broadway. 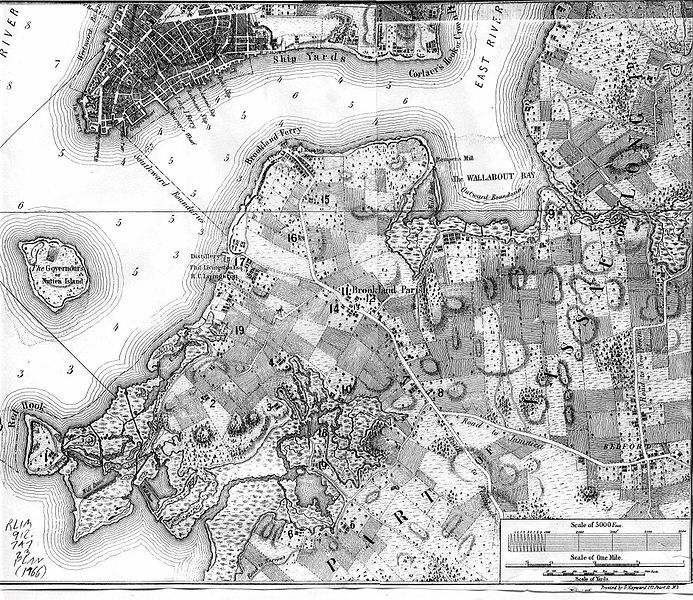 Washington soon discovered that much work still needed to be done to finish the construction of fortifications in Brooklyn on Long Island and on York Island. He was kept busy supervising their continued construction, inspecting the troops and deciding on command assignments and troop deployments. Another problem faced Washington in the City. The soldiers were growing sickly. Smallpox appeared causing the deaths of several of the men. In the summer heat, “camp fever” became epidemic, and poor sanitation caused dysentery. At least 3,000 to 6,000 men were ill at one time or another, and many died. One of the victims of these illnesses was William Brown (Perley’s brother), who died in a City hospital on August 27th after being sick for eight days. Also sick at this time was brother Benjamin, but his health improved so he could return to active duty. 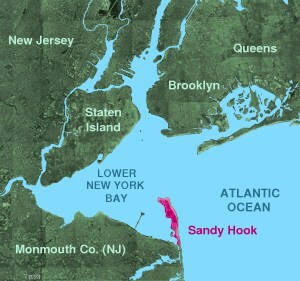 The long anticipated arrival in New York of the British troops began on June 29th when 120 British ships arrived at Sandy Hook, a barrier spit jutting northward into Lower New York Bay from the New Jersey shore. Three days later (July 2nd) 9,000 British troops from their Nova Scotia base left these ships to establish their new base on the unguarded Staten Island southwest across the harbor from York Island and directly west of the present-day southern part of Brooklyn. And the British ships kept coming with another 15,000 British and Hessian soldiers soon thereafter. On August 13th 96 more ships entered the harbor plus 20 more the next day. That summer more than 400 British ships with 1,200 cannon and 10,000 sailors under the command of Admiral Lord Richard Howe were anchored in the harbor, and more than 32,000 British and Hessian troops under the command of his brother, General Sir William Howe, were on the nearby land. This turned out to be the largest expeditionary force of the 18th century. The British, however, did not launch an immediate attack. On July 20th such a peace conference was held at the Kennedy Mansion on York Island. 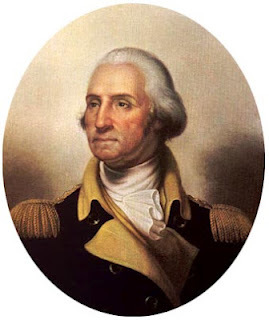 In the midst of polite formalities Washington said he understood that General Howe only had authority to grant pardons, but that those who had committed no wrongs wanted no pardons. This ended these British peace efforts. In the meantime, General Washington had 19,000 colonial troops in the area, but did not know where the British planned to attack. Therefore, Washington split the Continental Army into fortified positions in Brooklyn on Long Island and in Manhattan with some held in a reserve so-called “Flying Camp” in northern New Jersey to be deployed when they knew where the British were going to attack. The fighting phase of the campaign for New York and New Jersey began on August 22nd when the British troops invaded Long Island. Thus began what turned out to be the largest battle of the War (the Battle of Long Island or the Battle of Brooklyn) that lasted until August 30th with a British victory. Soon thereafter– on September 11th (an ironic date in light of its 225th anniversary falling on the day of the 9/11 attacks of 2001)–another attempt was made to end the rebellion peacefully at the Staten Island Peace Conference. The Conference participants were Admiral Lord Howe and Continental Congressmen John Adams, Benjamin Franklin and Edward Rutledge. The Americans insisted on British recognition of their recently declared independence. Admiral Lord Howe said he could not do that. Howe was also pressed to repeal the Prohibitory Act that authorized a blockade of the colonies, but he said he could not do that either. Instead, Howe offered to suspend execution of the blockade if the Americans agreed to end hostilities and make fixed financial contributions to Britain. This offer was rejected by the Americans. There was no peace agreement. The War continued. With the exception of an American victory at Harlem Heights on York Island, the British won all the military encounters of this campaign through Christmas Eve Day (December 24, 1776) and forced General Washington and the Continental Army to retreat from New York into New Jersey and then from New Jersey into Pennsylvania. Future posts will review the Battles of Long Island (Brooklyn), Harlem Heights and White Plains. The British victory in this campaign looked secure at that time. But on Christmas Day (December 25th) Washington and 2,400 of his troops made their now famous “crossing the Delaware River” maneuver. They crossed the partially frozen river from Pennsylvania to return to New Jersey to make their successful surprise attack on British and Hessian troops at Trenton, New Jersey. This was followed on January 3rd with another successful colonial attack at Princeton, New Jersey and Washington’s establishing his winter headquarters in Morristown, New Jersey. Fighting essentially ceased in January 1777 due to winter conditions. Nevertheless, it has to be said that the British won the Campaign for New York and New Jersey and that the British occupied New York City for the duration of the War. In addition to the hyperlinked sources in this post, it also draws from David McCullough, 1776 at 110-154 (New York; Simon & Schuster 2005). See also, e.g., T. Harry Williams, Richard N. Current & Frenk Freidel, A History of the United States [To 1876], at 151 (New York: Alfred A. Knopf 1959); Henry Steele Commager & Richard B. Morris, The Spirit of ‘Seventy-Six: The Story of the American Revolution as Told by Participants, Ch. Eleven (New York: Harper & Row, 1967). From July 1966 through March 1970, I worked for a New York City law firm with offices in the Wall Street district at the southern end of Manhattan.As a result, I frequently walked around the area where General Washington and the Continental Army troops lived and worked 190 years earlier, but unfortunately I did not scout out where things happened in the Revolutionary War. Carol Willits Brown, William Brown–English Immigrant of Hatfield and Leicester, Massachusetts, and His Descendants c. 1669-1994 at 18-19 (Gateway Press; Baltimore, MD 1994) (letter, Perley Brown to his wife Elizabeth Brown (Aug. 1, 1776)). By July 1776, Washington moved his abode and headquarters to City Hall because it was deemed to be more secure. By the way, No. 1 Broadway now is the location of an office building known as “1 Broadway.” Facing Battery Park, it was built in 1884 and extensively remodeled in 1921. Carol Willits Brown, William Brown–English Immigrant of Hatfield and Leicester, Massachusetts, and His Descendants c. 1669-1994 at 7, 20-21, 24-25, 31-32, 210-11 (Gateway Press; Baltimore, MD 1994) (letters, Perley Brown to his wife Elizabeth Brown (Aug. 1, 1776; Sept. 9, 1776; Oct. 4, 1776).